If you abridge a book or play, you make it shorter by making cuts to the original. If you describe a situation or condition as abysmal, you think that it is extremely bad or of wretched quality. Someone who is adroit is skillful and clever especially in thought, behavior, or action. When something attenuates, it lessens in size or intensity; it becomes thin or weakened. To augment something is to increase its value or effectiveness by adding something to it. A bravura performance is one that is done with great skill, especially when it is very difficult. Something colossal is extremely big, gigantic, or huge. If someone shows consummate skill at doing something, that person’s skill is very great or almost perfect in every way. A copious amount of something is a very large amount of it. A cynosure is an object that serves as the center of attention. If you say that a person or thing is an epitome of something, you mean that he, she, or it is the best possible example of that thing. An exiguous amount of something is meager, small, or limited in nature. If something is formidable it is impressive in size, power, or skill; it can make you feel frightened, alarmed, or in awe because it is so powerful or difficult to deal with. Something frivolous is not worth taking seriously or considering because it is silly or childish. Something that is gargantuan is extremely large. Someone who has had an illustrious professional career is celebrated and outstanding in her given field of expertise. Something that is imperceptible is either impossible to be perceived by the mind, or is very difficult to perceive. Inconsequential matters are unimportant or are of little to no significance. Ineffable refers to something that is so impressive and beautiful that you cannot describe it in words. If a person or thing is infallible it is never wrong and so is incapable of making mistakes. Something infinitesimal is so extremely small or so minute that it is very hard to measure it. If you describe something or someone as insipid you mean that he, she, or it is dull, boring, and has no interesting features; insipid food has no taste or little flavor. If you describe ideas as jejune you are saying they are childish and uninteresting; jejune also describes those having little experience, maturity, or knowledge. A leviathan is something that is very large, powerful, difficult to control, and rather frightening. Something that is mediocre is just average or adequate in quality. Something that is minuscule is extremely small in size or amount. A monumental event is very great, impressive, or of considerable historical significance. Nominal can refer to someone who is in charge in name only, or it can refer to a very small amount of something, both being related by their relative insignificance. Something nonpareil has no equal because it is much better than all others of its kind or type. A paragon is an example of a thing or person at its or her very best. Something that is of paramount importance or significance is chief or supreme in those things. If you describe something as pedestrian you think that it is ordinary and uninteresting. A precocious child shows advanced intelligence or skill at an unusually young age. Something that is prosaic is dull, boring, and ordinary. Something is quintessential when it is a perfect example of its type. A stupendous event or accomplishment is amazing, astonishing, or simply spectacular. A trite remark or idea is so overused that it is no longer interesting or novel. Something that is trivial is insignificant, commonplace, of little value, or not important. Something that is vapid is dull, boring, and/or tiresome. A virtuoso is someone who is very skillful at something, especially playing a musical instrument. Something that is voluminous is long, large, or vast in size. Last weekend we went to a gallery opening for a young painter who has taken the art world by storm with her impressive, extraordinary, and prodigious talent. Using her prodigious and amazing technique, coupled with her awe-inspiring knowledge of the old masters, she has created masterful and beautiful works of art. The artist will soon be able to ask and get prodigious or enormous prices for her wonderful work. Quiz: Try again! What does prodigious mean? The next new thing that everyone is talking about. Very large and great in extent. Something that is prodigious is very large or impressive and great. Pro Digger The Grave Digger (AKA Pro Digger) is a famous prodigious monster truck that was the biggest and meanest of them all. Ultimately from a root word meaning “omen;” an “omen” is a “saying forth” of the future, especially of great or impressive future events. 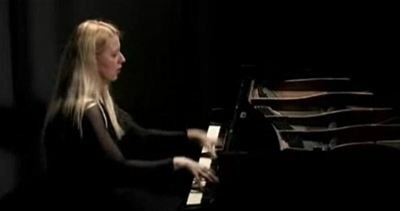 YouTube: Liszt Grand Galop Chromatique Valentina Lisitsa's playing is nothing but prodigious.